The all new Venus-223 includes a powerful Intel Skylake i5 CPU that dramatically increases performance over older generations of processors. With the Skylake CPU, processing performance has increased three times, while graphics performance has increased four times. With the increased processing power, the CPU is able to handle more application. The Venus-223 also includes 4K HDMI output which allows for extremely clear images to be displayed on both a primary and second viewing screen. In addition to the increased processing power and display resolution, the Venus-223 still includes all the best features made popular by the Venus Series; its silent fanless design; the dual hot swappable battery system that ensures the Venus-223 will never run out of power; the convenient reading light that makes the Venus-223 easy to use in low-light conditions; and the IP65 waterproof exterior that can be safely and easily cleaned with disinfectant solutions. We’re sure you’ll agree that the Venus-223 is the most powerful, efficient, and user-friendly mobile cart computer available on the market today. 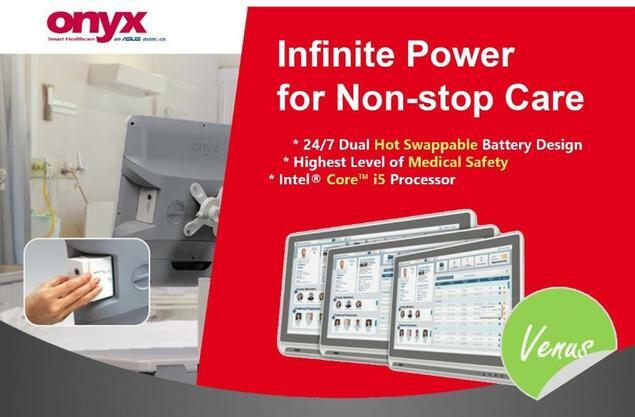 Contact your local Onyx Healthcare representative for more information on the new Venus-223.